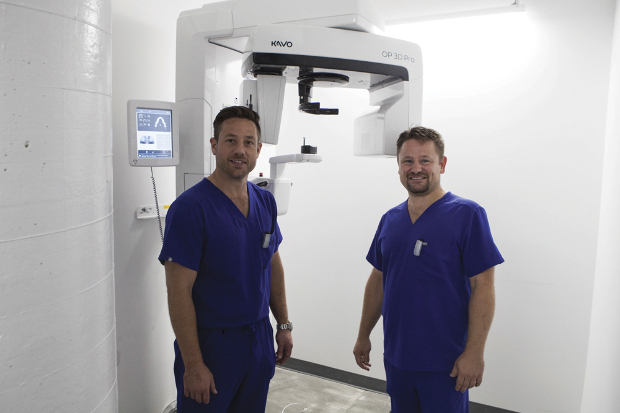 More laboratories around the country are investing in CBCT scanners in order to scan implant patients in-house, but along with the technology comes the need for more precautions. For example, Laboratory Owner Darin Throndson, who installed a CBCT imaging center right next door to his new laboratory, planned for the walls in the imaging center to be eight inches thick and lined with lead to prevent radiation from being leaked into the lab. In the lab, the milling machines are set up against the other side of that wall to ensure nobody is working in proximity to the imaging center all day. Per OSHA requirements, employees who work in the imaging center also have to wear dosimeter badges that measure radiation exposure; the badges can be plugged into a computer’s USB port to obtain exposure data. It was nearly 50 years ago that The Beatles released their hit song “Revolution.” Although the 1968 song was inspired by a different disruptive time in our nation’s history, the title is certainly descriptive of the transformative path our profession has followed in the decades that have since passed, especially in the last 10 years. We have witnessed the all-ceramic crown overthrow porcelain-fused-to-metal as the gold standard for the prescribed repair of damaged teeth in many laboratories. We have experienced vast increases in the strength and esthetics of the restorative materials we use. Most dramatically, in many cases our workflow process has transitioned from one that was purely analog to one that is primarily digital. For those who choose to walk the digital pathway, the first step of this new revolutionary workflow is to digitize the information coming from the patient’s oral environment. Most often, that means scanning a stone model in the dental laboratory with a benchtop scanner. This article intends to outline factors that should be considered when making a purchasing decision, describe the most common types of system technologies currently on the market, and take a peek at what new scanning technologies may be in store for our profession in the near future. Obviously, many considerations must be contemplated when entering the market for a laboratory scanner. Some involve money, some concern time, and some relate to compatibility with previously purchased equipment. The following discussion will help jump-start the thinking process about what you need to know before you decide to spend hard-earned capital on a benchtop imaging system. A scanner is most likely the first piece of equipment purchased when digitizing dental laboratory workflow processes. Other pieces of equipment and software can be added later as needs change and the business grows. With the help of a scanner, you can enter order data, scan models, and outsource all other facets of the restorative production processes if needed. Myriad outsourcing partners are available for both case design and case fabrication. The scanner that you choose may very well determine which outsourcing partners you can work with and what product lines you can add to the digital services you offer in the future. Therefore, great care should be taken to not make the decision with haste or without planning ahead for growth. Find out what types of files the system is able to output. Some scanners only output proprietary file formats that require you to stay “in network” to utilize the digital data. Other scanners are more “open” and output file types that can be read across multiple digital platforms and software. Some common file types used by dental laboratory scanners are .stl, .ply, .obj, .lab, and .xml. • How much time is required to enter order data into the software? • Does the software integrate with the laboratory management software that your business uses? • When sending the data to third parties, does pertinent information auto-populate, or must it be entered a second (or third) time? Precious time can be wasted duplicating information if the systems are not compatible. • Does the scanner require opaquing (most commonly with titanium dioxide powder) of the models before scanning? • What is the preferred die stone for optimal imaging results? • How long does it take to scan in a typical case? • Is the scanner automated to just load the models and go, or is labor involved to collect the correct data? • How difficult and time-consuming is the calibration process, and how often does the scanner need to be calibrated? • Is the design software included in the price of the scanner? • Are there yearly licensing or module fees for the software or for updates to the current configuration? • If you decide not to pay the fees after a period of time, can you still use the scanner or will it be rendered useless without yearly payments? • Who will handle the repair work if needed? • How quickly can the company service the scanner? • Do they have support technicians nearby and repair centers in the US? • Is there a loaner program if your equipment is malfunctioning? • Are there monthly or yearly service maintenance fees, or hourly rates for repairs and maintenance? • How is the initial installation handled? • Is a company representative available for any questions or problems? It has been said that all technology is only as good as the training that accompanies it and the ongoing support that follows. Knowing who provides the initial training will be important. Do they come to you or is travel required? Is help available online? Do they have YouTube videos to watch? Are there Facebook user groups to help? What is the typical learning curve? How much downtime at the laboratory can be expected? How many personnel can be trained in a single training session? Who handles ongoing support and education needs? Can the company remotely access the scanner to diagnose and help solve any issues? Who handles problems that are beyond the capabilities of the distributor or reseller of the scanner? • Is impression scanning supported by the hardware? • How accurate is the scan without a physical model? • How long does scanning the impression take? • Can the file be sent to a 3D printer for model fabrication after the impression scan? In addition, most systems today are used for crown and bridge applications. Is the scanner also able to scan for digital denture applications? Can the unit image for implant restorations? If so, which manufacturer’s implants are compatible, and which implant scan bodies need to be used? How much do the scan bodies cost? What is the cost for outsourced digital abutments and/or screw-retained crowns? What is the size of the scanning area? Can it handle full-mouth cases? Is it big enough to hold an adjustable articulator? Can both the upper and lower jaw scans be scanned at the same time? Will the machine image multiple dies at once or each independently? As these questions and considerations indicate, the decision about which type of scanner to buy can hinge on many factors. Those factors often depend on the different types of technologies that dental desktop scanners use to capture and digitize information from the physical model or impression. Most utilize laser triangulation, strip light scanning (both white and blue light), or conoscopic holography. Lasers are a quick and efficient way to measure an object. Laser triangulation involves a camera, laser emitter, and the surface of the object being scanned. The laser emitter projects a laser dot onto the surface object, and the camera records the location of the corresponding laser dot. Based on the angulation of the camera to the corresponding laser dot, a distance can be determined. When repeated many times over, a digital map of the surface object emerges. Most often in the dental world, a laser stripe will be emitted to speed up the process in lieu of a single dot. The technology is called triangulation because the length of one side of the triangle—the distance between the camera and the laser emitter—is a known constant. The angle of the laser emitter is also a known piece of data. The angle of the camera corner can be determined based on where the dot falls in the camera’s field of view. Triangulating all of this information renders the shape of the object. Strip light scanning is also a common method of rendering a digital image of a dental model. Both blue and white light are used, depending on the scanner, to accomplish the imaging goals. A good analogy to understand this technology is to envision open venetian blinds and the shade pattern of horizontal stripes projected on a table with light shining in from the window. Now imagine setting a bowl on the table. The bowl will distort the parallel lines of the light beams. A camera reads the distortion of the lines and can form a digital map of the object based on the patterns. Two advantages of strip light scanning are its speed and its precision because the object being scanned, the dental model, is motionless. Another scanner technology involves conoscopic holography. These scanners use a light beam projected through a lens and onto an object—in our case, a stone rendering of the patient’s teeth. The light reflection is then sent back through the lens and into a conoscopic crystal, where the distortion of the light pattern is read and analyzed creating the virtual 3D image. We could see other exciting technologies in dentistry soon. S-Ray ( s-rayinc.com) is developing an ultrasound technology that will be released in both a chairside application, which will be able to read through soft tissue and moisture, and a benchtop version that will have the capability of scanning both impressions and solid models. A couple of unique consumer-level scanners that may have potential dental applications are imaging systems made by eora ( eora3d.com) and Autodesk ( 123dapp.com). eora uses a unique compact green laser scanner that connects to a smartphone, with the object sitting on a Bluetooth-powered turntable. The green laser technology captures multiple images of the object that the smartphone then processes into a 3D image. The resulting digital file can be saved as an .stl file for import into dental software. The Autodesk app, meanwhile, uses the camera already installed in a smartphone to image objects. The images are then converted into .stl files that can be read by dental software. These are just a few examples of the many advancements in the 3D imaging market. Many more will come in the future. Doing your due diligence and getting the answers to your questions ahead of time as well as understanding the different types of scanner technology can help to ensure a smooth integration of the technology into your laboratory. Darin Throndson is President of Innovative Dental Technologies in Memphis, Tennessee.